Top-Ten Activities that must be done on the National Geographic magazine’s second best coast in the world. These are our top ten favourite activities in Pembrokeshire. 1. 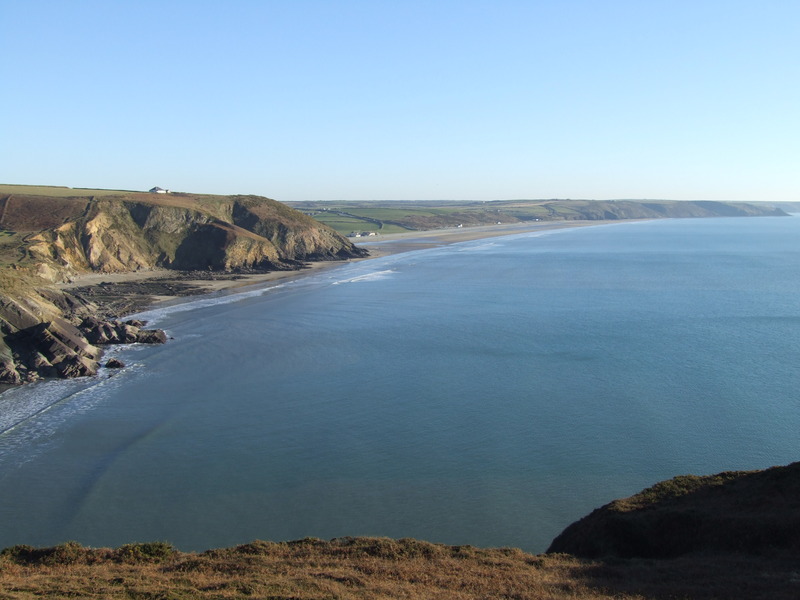 Walk the Coastal Path – Current personal favourite walks are Abereiddy to Porthgain – 3 miles and the Coastal Path from Porthclais to St. Non’s Chapel and the birthplace of St. David, returning via St. Davids – 3 miles. 2. Haverfordwest Farmers Market -one of the best in the country- Every Friday – take some local produce home with you. There are some great shops in H’west though spread around – Market street has , a butcher selling the finest meat and local cheeses and Georges, a great shop (clothes, cards, gifts)and restaurant, though now sadly only open in the day. Vincent Davies is an excellent independent out of town department store on the Fishguard road. 3. Art Galleries in St. Davids and Porthgain. 4. Eating out locally – We recommend The Druidstone Hotel, Georges in H’west (lunch only now , the Swan in Little Haven and The Cambrian Inn, No.35 in Solva. Our local pub, the Victoria Inn, offers the atmosphere of an old fashioned pub, with quiz night on Wednesday, Ukelele night on Thursday and pie nights(Tuesday) and curry nights. (Friday) Further afield at Dinas Head there’s The Old Sailors with great fresh fish and wonderful sea views. For Vegans/Vegetarians Druidstone offers the best choice, every tuesday throughout the year is a themed feast evening. 5. Newgale Beach – at low tide – two miles of sand – two miles of fun. Kites, Surfing, Canoeing etc. 6. Catch a Rigid Inflatable – For a special ride take the inflatable around Ramsey Island – seals in nearly autumn. Puffins on Skomer from April – July are an essential part of any Pembrokeshire experience. 8. Drive to the Preselis – Lunch at the Tafern Sinc and afternoon at the fine harbour and village of Newport. Or better still, enjoy a car-free day in the summer using the dial-a-ride buses. The Park also includes the Preseli Hills and some wonderful offshore islands, home to many thousands of sea birds. The coastal path is 186 miles long. The flowers are spectacular, the most exposed areas carpeted with pink thrift or white campion and in more sheltered areas there may be a natural rock garden or herb-rich grassland. You can also see Gorse, Bell Heather, Tormentil, Orchids, Birds Foot Trefoil, Storksbill, to name just a few. East Nolton Riding stables are just two miles from Cuffern. They ride on the beaches. The Coastal Path is just two miles from Cuffern Manor. (The grid reference of the nearest point on the coastal path is 851219) There are five bus services which run around the coastal path, three of them all year round, so that you can walk and return by bus. The network of buses has been described by Colin Speakman, a sustainable transport consultant as “brilliant and hugely successful, and among the best and most innovative practice in the UK today.” One service, the Coastal Cruiser, won a Welsh Gold medal in the Green Dragon Environmental Awards 2004. It operates on bio-diesel and is the first bus in the UK to carry bicycles, wheelchairs and surfboards. The national park is considered a leader in efforts to provide accessible routes . We can meet you at or near Newgale beach and drop you off again the next morning. But you can chose to stroll out from the Manor and up onto Cuffern Mountain behind the house, once belonging to the estate and described by Fenton after his stay at the house in 1814 as but “heathgrounds, and good for neither pasture or corn”. Also near is Dudwell and Plumstone Mountains, an SSSI due to being a rare example of low level heathland. The grid reference of the nearest point on the coastal path is 851219.
www.pembrokeshirecoast.org.uk is the National Park website with walking maps and transport information. The following local buses are available. Click on the link to see a video of the route. Cuffern Manor is only a mile from the National Cycle Network Route 4 at Roch. Follow Route 4/47 of the National Cycle Network (Celtic Trail West). Copies of the map are available from www.sustransshop.co.uk. 50 miles of traffic-free cycle paths and the council have produced great maps, available from tourist information centres or from us here at Cuffern. Emergency cycle repair kit Details of local cycle shops Drying facilities and storage for rucksacks, etc. Luggage transfer to the next stop in the area (there may be a charge for this) Information about cycle facilities on public transport.Recently opened Lon Teifi long distance route 82, 98 miles from Aberystwyth to Fishguard completes the link with the Celtic Train around the Pembrokeshire Coast. See www.cyclepembrokeshire.com. Mikes Bikes of Haverfordwest will bring your hire bikes to Cuffern Manor. The National Park has some of the best sea fishing in Britain and the path provides some of the best scenic fishing points you could wish for. The beaches are perfect for beach-casting anglers, with good bags of bass and flatfish a possibility. Not far away the Llys-y-fran Reservoir and Country Park offers the largest game fishing venue in West Wales with 212 acres of mixed rainbow and brown trout. There are four main fishing rivers, the eastern Cleddau, the western Cleddau, the Nevern and the Teifi. Away from the coast a trip to the Preseli Hills is a must, its ancient landscape is littered with some of the finest megalithic monuments in the country. The ancient standing stones and burial chambers, built as tombs 5,000 years ago by our prehistoric ancestors. Use the Preseli Green Dragon Walkers Bus. This dial-a-ride service around the hills allows you to do linear walks. It operates in August and September and connects with other local bus services so you can enjoy a car-free day. All the Pembrokeshire Islands are accessible by boat with trips from various locations around the coast. Skomer has iron age remains, victorian farm buildings and flowers and birds in abundance with the largest colony of puffins in southern Britain and in season 100,000 pairs of Manx shearwaters. Peak time for Puffins is May-July. Skokholm also has large colonies of birds, particularly Manx shearwaters and petrels. Its 247 acres is an exceptional island for wildlife, its summer puffin colony being the second largest, after Skomer, in the south of Britain, its wild flowers being exceptional in May/ June. Grey seals are there all year but the absence of good breeding sites reduces the number of pups born. Ramsey Island is the largest stronghold for the grey seal in southern Britain and upwards of 600 pups are born from the late summer onwards, on the beaches and in caves. Thousand Island Expeditions 01437-721721 are the only company that will land you on the island but others will take you around it. Newgale is one of Pembrokeshire’s finest beaches and the perfect place for beach and water activities. Surfing gear can be hired 20 Pembrokeshire Beaches have been awarded the very highest EU, Blue Flag, standard. These include Whitesands, Newgale and Newport. The west Wales coast has been named as the third most popular destination surfing destination in Britain. Newgale and Whittesands are two excellent surfing beaches close to Cuffern Manor. Not surprisingly the nature and landscape are an inspiration to many artists and crafts people and the area has a wealth of workshops and galleries. At Solva the Raul Speek Gallery has Cuban/Welsh colourful paintings. The Oriel Albion and the Sculpture Studio are two galleries in St.Davids. Pembrokeshire prides itself on its food. We can provide good local food for your lunch or evening meals and visits to the farmers’ markets and fine restaurants in nearby Havens and Solva are recommended. Why not visit us during the food festivals held in West Wales? Two top class cultural venues are within half an hour drive from Cuffern Manor, the Queens Hall at Narbeth and the Torch Theatre at Milford (telephone 01646 695267) offer a varied programme of music, theatre and comedy. The Theatre Mwldan in Cardigan (telephone 01239 621200) also offer a varied programme. We are not far also from West Wales’ finest concert venue, the striking new hall at Rhos-y-gilwen, which has a full programme of top class acts, jazz, folk and classical. In the winter and spring top class music acts can be seen every month in the unique setting of Martletwy Chapel, a small, restored non-conformist chapel with tiered seating. Sea Watch Foundation Sea Watch is a national marine conservation research charity dedicated to the protection of whales, dolphins and porpoises (cetaceans) around the UK.